gate48 in cooperation with NieuwLand will live-stream the Israeli-Palestinian Memorial Day Ceremony of Combatants for Peace and the Parents Forum in Amsterdam. We invite you to join us for the screening of this unique event and for a conversation about inclusion and non-violent resistance in present day Israel/Palestine. 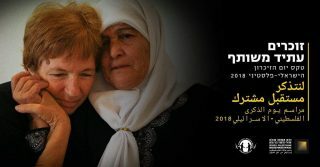 Since 2005, the Israeli-Palestinian NGOs Combatants for Peace and the Parents Forum have been organizing a joint, inclusive ceremony for Israeli-Palestinian Memorial Day in Tel Aviv. The goal of the event is to challenge the consensual narrative and offer an alternative that denounces war and contests the legitimacy of violence. As of last year, the organizers have been encouraging screenings and satellite events in cities throughout the world. The event at NieuwLand will be moderated by Erella Grassiani, board member of gate48 and anthropologist at the University of Amsterdam. is an incredibly significant day on which Israel honors its citizens who lost their lives in battle as well as victims of political violence. It is a solemn, national holiday and considered one of the most important days for Israelis. Official commemoration services are held in the presence of Israel’s political and military leadership and private memorial gatherings take place in cemeteries where soldiers are buried. These events have become a powerful tool for shaping a collective narrative of sacrifice – honoring the fallen for the “greater good” of the country. These ceremonies often justify the political status quo and provide a platform for patriotic nationalism and a one-sided narrative. The traditional commemorations ignore the fact that violence has taken the lives of thousands of both Israelis and Palestinians over the years.